Do you want to know what makes a video viral? What kind of videos goes viral on Youtube, Facebook, Instagram, Dailymotion etc? If you are a content creator on YouTube, then you already know what is the importance of being viral on youtube. Viral videos are one of the easy shortcuts to gain lots of views in a short time. Also, it brings you more subscribers and revenue at the same time. But, the other part of the story is that creating a viral youtube video is not an easy job. …nor there is any secret sauce to create one. So the question is how to create viral videos? I will show you the most important things you should keep in mind so that will help you to go your videos go viral on the internet for free. So let’s just head into the topic without wasting much of your time. In simple words Viral means rapid. Like if any online content like a social media post, image or video getting unpaid shares from millions of users from Social Media. Then it simply means that the online piece of content goes viral. That means people are loving your content. You are sharing meaningful information online, and that’s why people are liking them very much. However, the viral thing does not work for everyone out there. Nor it is easy to get shares from different users on social media. Also, another thing that most of the people consider as a viral post when a video Ad is getting thousands of shares for every million views on Facebook. Then the ad publisher officially becomes one of the top 5 percent of “most viral” advertisers on Facebook. But the truth is that it is not really going viral. It simply means that the facebook page has a high engagement rate, so more and more people are watching it. Back in the time Facebook and YouTube used to have a kind of the same algorithm for showing the videos to the right people. The job of the algorithms is to identify and recommend trending videos you might be interested in. So the videos can appear in news headlines, and more and more people would join their platform. However, over time there are quite a lot of things that got changed. 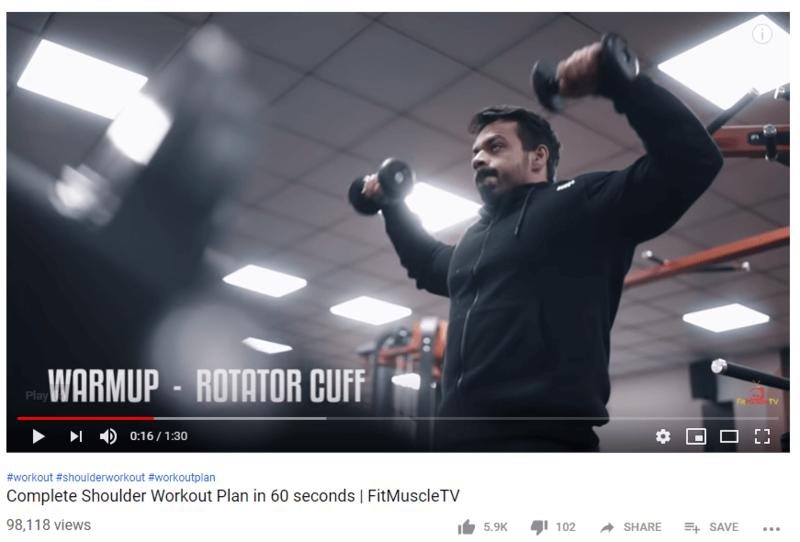 Now platforms like YouTube are picking up videos on the basis of upload consistency, duration, watch time, relevance, quality, and a few other metrics. Hence, for you, Youtube is the best choice to get started with. Let me share you one example here. 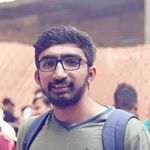 A few days back, my friend Iftekhar Ahmed has shared one post on Facebook about how one video went viral on social media platforms and especially on Youtube. 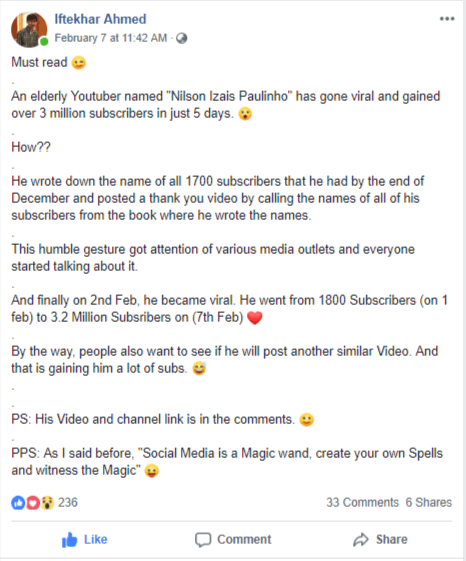 The guy named Nilson Izaias Papinho thanked his 1700 subscribers till December and he made a thank you video and called names of all 1700 subscribers and due to this love of gratitude towards his subscribers, people loved it. You can check that video from here. So, sometimes if you think outside of the box ideas to create videos then you can easily get subscribers in a minimum time frame. 1 How Things Go Viral on The Internet? 4 How to Monetize Viral Videos? How Things Go Viral on The Internet? 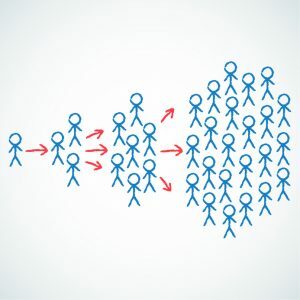 Getting viral simply stands for getting thousands to millions of shares and viewers. But the question is how a youtube video managed to receive that much of viewers count or reasons why videos go viral? Well, you do not need to hit your head really hard to find the answer. Instead, let me explain the simple logic to you. First thing first, you need to understand that by simply uploading a video you will not be able to get millions of viewers. Since just like you, there are quite a lot of people are uploading videos on youtube on a daily basis. And there is already a hell lot of content to watch. So if you want to make your videos go viral, then you need to tell people about it. Like you can start with your friends, and they will surely check out your videos and give you some views. Maybe the number of views that you will get from your friends will be 100 or 1000. Now, you might be wondering… I still need a hell lot of videos, right? Well for this, initially, you can simply ask your friends to share your videos on different social media platforms. Like you and your friends tweet or post your youtube video links on different platforms. You can also tweet your videos to some influences in your niche, and if they give your tweet a retweet, you will get a few thousands more viewers and shares. Or you can simply email some influencers and ask for a shout out for your video. If they like your video then he/she will with their audience. Moreover, you can post about your videos on local news sites like Reddit and make more and more people watch your videos. And once your video is viral enough, there will be top media publications houses posting about your video which means more viewers, shares, and subscribers. It’s a long term process but you have to follow it. If you want to make yourself a brand in your niche and want to make youtube channel viral. Now, let’s see what are the things you should take care while making videos which can give you more views, engagements, and revenue. A story is extremely important for any video out there. Like as a viewer what you would see in a video? cool shots, people in the video or it is the story? Obviously, story. If the video has no story, then there is no meaning of the video. That is why whenever you plan to make a video. First, figure out an idea, and then you should focus on creating a story. And once there is a story you just need to make a video and put it up there. For example, if you look at vloggers on youtube and their most viewed videos, you will find that all of the videos have a story to tell. So, in the end, look around take inspiration and make videos that convey a great story. And soon of your videos will go viral. One of the main benefits you will get is you will be connected with your readers. Like they feel you are telling the exact words they wanted to hear from you. It connects with the reader’s mind. Have you heard about AIDA? It’s Attention, Interest, Desire, and Action. You can use the AIDA formula as well. How do you achieve a longer watch time for your videos? You have to keep your viewers, subscribers interest alive during the video. And that’s when a great story helps you. Here, I’m giving you some best resources to learn how to craft a great story for your videos. In some niches, you can’t include a story. That’s fine, you can use other ways to make your videos viral. Thumbnail also plays an important role in any video. People do not just read your title but they also look at the thumbnail before clicking on a video. You have probably seen YouTubers reacting wow on their thumbnail. This is because they want to make people click on their videos. However, I am not saying you should do the same. But make sure to keep a thumbnail which is extremely attractive and it is convincing the people to click on the video. You can ask yourself, will I click on this thumbnail if I see the video? And you will get your answer. Use pain problem of your targeted audience as a title in your thumbnails. Give them an instant solution in thumbnails. Use good color combination images. Be consistent with your thumbnails in terms of using colors, and fonts. 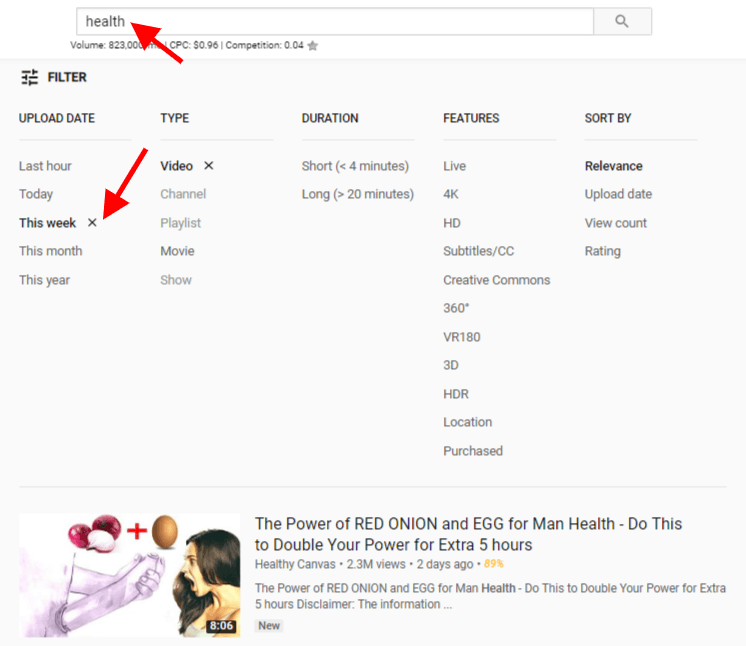 In the first video thumbnail, the text is “175.59% More Traffic (In 30 days)”. Also, he used his blog name “Backlinko” to share his blog. Eye-catching headline that tells How I/we achieved 175.59% more traffic in just 30 days. Awesome color and font combination. Use of relevant icons that show an increase in traffic and calendar which shows 30 days. In the second video thumbnail, again, nice attention grabbing headline of “ 15 SEO Tips (That Actually Work)”. He is sharing his 15 all-time best SEO tips with you. …Also, that can work for you. Wouldn’t you click on this video at first glance? Because he covered most of the important aspects of awesome thumbnails. Now, let’s go to the third point. Of course, you would disagree with me that to make a video viral you will need strong marketing skills. But do you really think it works like that way? Well, there are quite a lot of popular youtube videos are there who went viral. And the creators behind it did not even prepare a marketing plan. For example, we all know about Justin Bieber and how his life changed after one of his videos went viral? Well did his mom plan any marketing plan? She did not. Hence I am penning down the fact that A Marketing plan is not always necessary. Even if you prepare a marketing plan and promote the video on different platforms through ads. But when a viewer watches your video and may like or not like it, then it will not work for you. Instead, it will be an embarrassing moment for you. Since you have put so much of your effort to promote the video and the video, do not even work out the way you planned. Instead, what you should do is that you must focus on your content. If your content is good enough, then views and shares will come on your way. Then you ask me, Aakash, how can I come up with great content?. I would say find your target audience problems and solve them with unique angles/ways. Do better than your competitors. That’s it. On the other hand, I am not saying that you do not need a marketing plan. Of course, a marketing plan is pretty much required, and it will help you to make your video go viral faster than ever. When you want to grow your youtube channel to good numbers of quality subscribers then you will need a solid marketing plan. It’s a long term process. But in initial days, just make videos to solve either your audience problems or entertainment them. You will get more likes, shares, and subscribers over a period of time. When you make a video, you show different products on your videos or app. For example, if you are making a dance video and you have shown that you have played the music using the Spotify app. Or if you have worn some branded clothes or using any accessories. Then you can simply reach out to these companies and ask them to share your videos. Since your videos could give them exposure and it will help them to create brand awareness. Furthermore, you can also put sponsored links under the video description. Although, you should only do this if you and a brand is partnering together. Else, it would not help you anyways. So first you should have a talk with a brand and then ask them for sponsorship. Even if there is no sponsorship happening then do not worry. You can still ask them for sharing on their social media accounts. And if they do so, then you will get more and more viewers and help you to make your video go viral. Note: Do remember the fact that all the brands out there might not be interested in sharing your video. So even if they do not want to share your video. Then be cool and ask someone else for the same. Content is the king is something that everyone talks about, and there is no doubt in it. Like if you want to make your video go viral, then you need to have a strong content that people who love to watch or share. If your content is not up to the mark, then people would not even bother to watch it. Through your content, you need to understand people’s emotion and make them convenience that your video is the best one, and as a viewer, they should share them. And this is where your content plays an important role. Have you heard about beer biceps? I really love his content, The team is putting lots of hard work behind making videos every single week. Just look at their content, images they are using, speech they are delivering…. How do they able to work hard every single day? Because they know they have to create valuable content for their youtube channel. For that, they research and experiment a lot. If you want someone to get inspiration and motivation then I would recommend you to follow beer biceps. Later on, You can ask your friends to share your video or run some ads to make people watch your video. But unless your content is not worth watching, you will not be able to get organic viewers. Also, as I just mentioned that you need to play with people’s emotions. This means specific emotions spread better than other ones. Like if you make a video that promotes, awe, excitement, amusement, anger, anxiety are more likely to get high engagement compared to any other emotions. So don’t forget to include emotions in your videos. And in this scenario, a great story can work for you. How will you make people click on your video? Obviously by making them read your video title and looking at the thumbnail. Audience out there do not know what your video is about. Nor they care how much time you have put in to make the video. Viewers will only click on a video which seems interesting. Like if you go to YouTube’s trending page, you will find that all the videos have an interesting title that will make you click on the video. And once they have clicked on a video, they are hooked, and the rest of the thing will be handled by your video. If your video is good enough, viewers will be stuck with your video. Else, they will hit the close button or go to watch someone else’s video. But before you make viewers watch your video, you need to attract the audience. And this is where the title plays an important role. Longer videos perform better on youtube. Probably one of the first thing that many people do is that they check how long a video is. Because they do not want to spend their precious time watching something which takes too much time to understand the topic. Like if you have a really long video for about 20 minutes. Then people are more likely to ignore it. Here’s we are not showing them a movie, remember this. But if you have a video of about 7 to 10 minutes, the people will surely love to give your video a try. What I mean to say is try to convey your message in the minimum time frame to your audience. Don’t make a video too long for getting SEO benefits. That is why you should make videos as short as possible along with delivering your message. People get bored when you aren’t sharing something in which they don’t interest. They will close a video in a few seconds. …and go to the next video. What to do to keep your viewers on your channel or FB page? Share practical tips and hacks. When you share practical & live examples, they understand your topics better. They understand what you want to say. The flying beast guy, Gaurav Taneja. Do you know why he got this much subscribers? Because he is sharing live examples in his videos. He is delivering valuable knowledge to his audience. That’s why people are liking him than any other fitness channels. Hence, you should become more practical while making videos. When you make videos around trending topics within your niche then more chances are that your videos go viral. …And you are helping with your videos. How to know what are the trending topics right now? #1: Go to youtube.com and search for your targeted term. #2: Click on the filter and choose Upload date to this week or this month. #3: Now, you will have some amazing videos that can help you in creating a viral video. The last question is that what to do once you go viral? Well, do not worry there is nothing that you have to do. Instead, do remember the fact that some people out there will criticize your work and you probably get a bad response from your videos. And this is pretty normal since not everyone knows how to appreciate someone. Also, there will be racist and sexist comments, and all these are pretty normal. But what you should do is you should not let these comments and reviews affect you at all. You should not give any attention to negative comments. If you do, then you are just wasting your time. But apart from those bad comments, there will be a hell lot of good comments too. Make sure to reply to them instead of celebrating your success. Also, you may get a few emails from some top brands. So make sure to look for them as well so you can get a few other opportunities in the future. So these are some of the top steps that you should follow to create viral youtube videos. But many of us do not just want to create youtube videos to get subscribers or watch time. How to Monetize Viral Videos? What is a better option than YouTube’s own monetize platform? Well if your channel has the minimum requirements to or you can say 1,000 subscribers and 4,000 watch hours within 12 months on your Channel. Then Google Adsense is the best way to monetize your channel. YouTube will put ads in your videos and let you earn from all the clicks and impressions that your videos will receive. You will find the monetization option under YouTube’s creator’s page. Affiliate marketing simply stands for promoting a product or service on behalf of others through your links. And if someone purchases the product or service through your link, you earn a commission, and this is what known as affiliate marketing. For example, along with your viral video, you can let people know about which camera you have used to shoot the video or the software you have used. And leave their affiliate link over there. So if any visitors gets interested in the camera or software, then it will be easy for them to buy it through your link. And in between, you will earn a commission. It’s easy and you do not have to follow the YouTube monetization rules at all. There are quite a lot of bloggers and YouTubers are earning a hell lot of money from sponsors. Brands out there are always looking for people who can share their products to a wide range of audience. And when you start making a viral video, then you can pitch to some brand for sponsorship opportunities. And if they get interested enough in your channel, they will ask you to talk about their products or do product placement in your video. And you will able to earn money. Also, this is another case where you will not need YouTube monetization requirements to monetize your videos. However, there are a few precautions that you should keep in your mind. First thing first you need to promote products that you trust. You cannot go and promote a fake product to your audience. This will risk your own image. Second, you should only work with brands whom you trust. Because in some cases after making a video the creator does not get paid. And I do not think you want the same thing happening to you. Amazon Influence is one of the recent programs that Amazon has introduced. 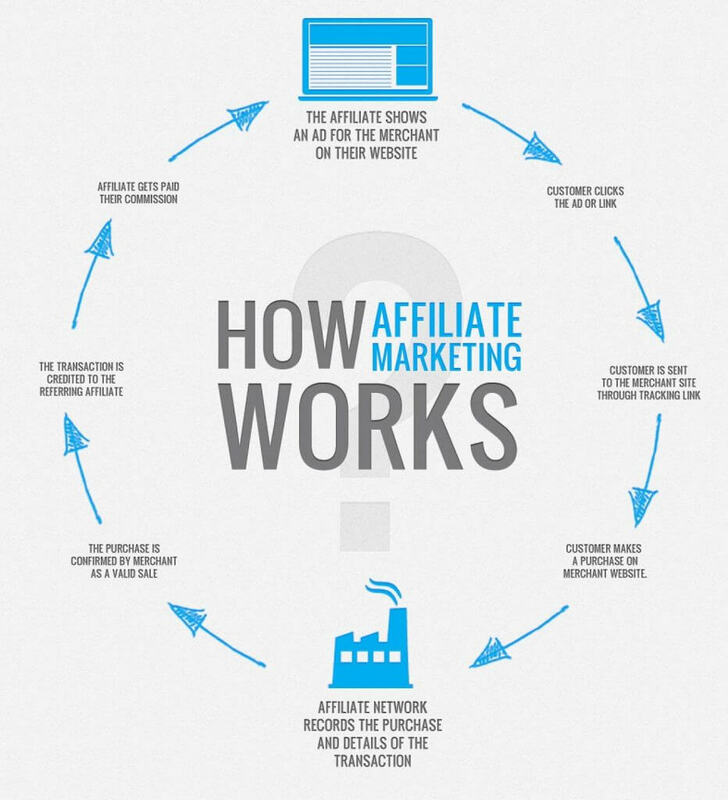 This is quite similar to Affiliate Marketing, but it is different in many cases. Like, first of all, you will need to have an approved account with them. For this, you can simply link yours on YouTube, Facebook, Instagram and Twitter page with your Amazon Affiliate account. And once they approve their account, you will have the ability to create a page on Amazon filled with products you recommend. For example, you can make a page of the gears that you personally use or the stuff that you use for creating your YouTube videos. And just like affiliate marketing, if someone purchases anything from your page, you will earn a commission. Recently YouTube also has launched a new feature called Subscription. The subscription button usually appears as a Join button. So if you have a good fan following on youtube then you can make your fans to join your channel so they can get some extra benefits. Like they will receive exclusive loyalty badges in the comments and live chat. They will also get access to custom emoji. Access a special live video once in a month and a few other things. Your fans need to join the subscription thing by paying a few bucks to YouTube and then there will be a cut from YouTube’s side on the amount and you will get rest of the money. The last thing that you can try out is selling march. All the popular YouTubers out there are launching their own merch which does not just helps them to create a social presence for them. But the other way, they also get to earn money by selling merch. Although, selling march is not easy to do a job. But luckily nowadays there are quite a lot of websites out there which lets you sell your merch without paying anything. Either way, you can reach out to some people or brand who you think can help you in the merch thing. So that was a complete guide on how to create viral videos and how to monetize them. Now it is your call to go ahead and try out the above-mentioned tips and see how they are working for you. It doesn’t matter which platforms are you using. Whether it’s facebook, reddit, youtube or instagram, above tips will be the same to make a video go viral online. Also, do remember the fact that patience is the key. You cannot simply upload one video and wait for it gets viral. Instead, do consider uploading regular videos to your channel and wait for the bubble to get busted. Also, for any questions, do feel free to comment below and I will surely try answering your question related to the topic.